Thank you for your trust in our company and for buying the new Energy Headphones 2 Bluetooth. We hope you enjoy them. Do not expose your Energy Headphones 2 Bluetooth to impacts, dust, humidity or high temperatures. Headphones with on-ear design that covers the ears providing exceptional comfort and even better noise isolation. You will forget you are wearing them. Attention to detail to make the difference and make your headphones trendy. Self-adjusting headband, ultra-lightweight design and 180 degree folding system for better ergonomics to listen to your music for hours. Carrying case included to carry your headphones comfortably. To turn on your Energy Headphones 2 Bluetooth, press and hold the multifunction button (3) for 2 seconds. You will hear a confirmation sound and the status indicator (4) will glow blue. The status indicator (4) will keep flashing blue while your Energy Headphones 2 Bluetooth are on. To turn off your Energy Headphones 2 Bluetooth, press and hold the multifunction button (3) for 2 seconds. You will hear a sound when turning off the headphones. When the battery level is below 10%, the indicator (4) will flash red and you will hear a sound to remind you to charge the battery. The status indicator (4) will glow red while charging the device and will turn blue once the charging process has been completed. Connect the microUSB end of the USB cable provided to the CHARGING PORT (5) of your headphones and the other USB end to any device with an USB charging port that provides energy (PC, USB wall charger, car charger, etc) to charge the battery. The charging time is approximately 3 hours. Do not store or leave your device completely discharged for a long period of time. 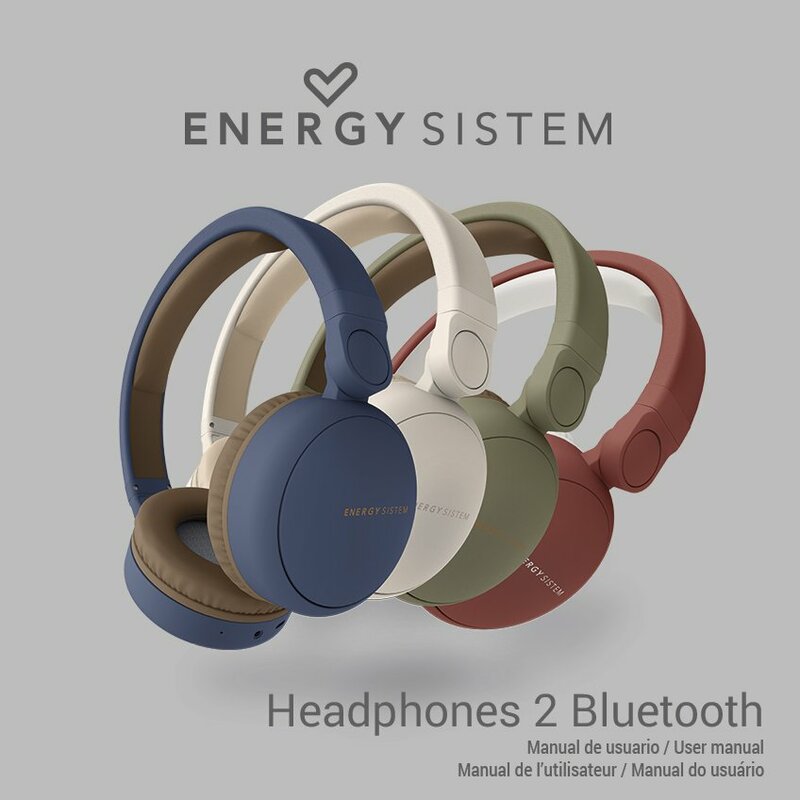 Once your Energy Headphones 2 Bluetooth are off, press and hold the multifunction button (3) for approximately 2 seconds, until the status indicator (4) starts flashing blue and red. At this point, your headphones and your Bluetooth device can be paired. Once "Energy Headphones 2" appears on your devide screen, press "connect". You will hear a sound that confirms that both devices have been paired correctly. If you previously paired your Headphones 2 with your music player, they will connect automatically next time. If you want to synchronize them again, press the multifunction button (3) twice. You will hear a confirmation sound and the lights will flash red and blue. At this point, your device can be paired once again. After 5 minutes in search mode, if they are not synchronized with another device. After 30 minutes, if they are synchronized and music is paused. Once your Energy Headphones 2 Bluetooth are syncronized, you will be able to control basic playback functions such as turning up and down the volume and switching to the next or previous track directly from your headphones. Press the VOLUME + (1) and VOLUME - (2) buttons to turn up and down the volume respectively. You will hear a sound when reaching the maximum and minimum volume levels. Press and hold the NEXT button (1) to switch to the next song. You can also press and hold the BACK button (2) to go back to the previous song. 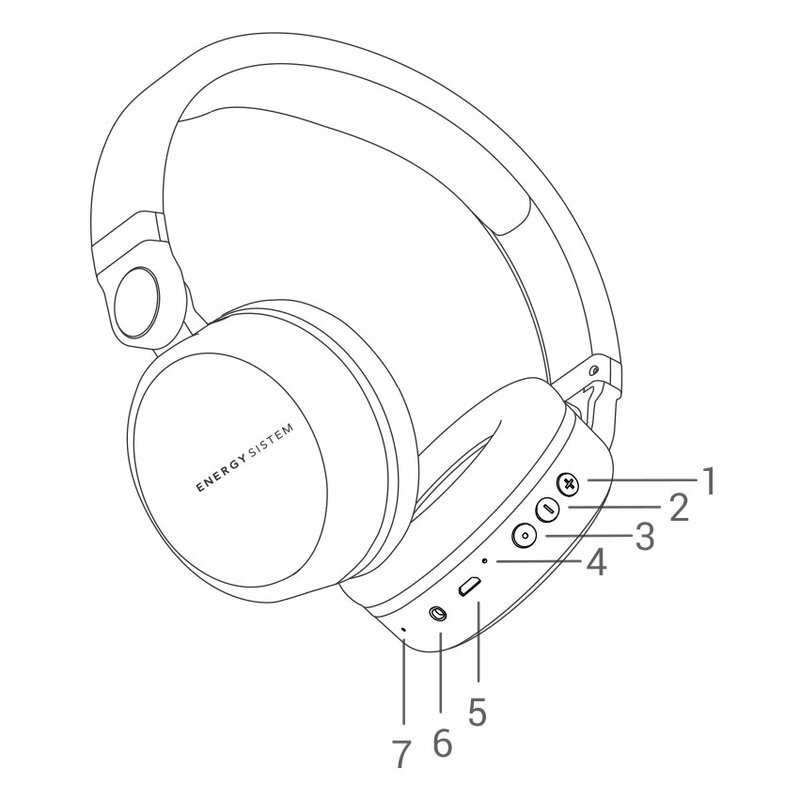 Once your Energy Headphones 2 Bluetooth and smartphone are synchronized, you will be able to answer calls thanks to the built-in microphone (7) while wearing your headphones. Press the MULTIFUNCTION button (3) to answer an incoming call. If you are listening to music when you receive a call, playback will pause and you will hear an incoming call sound. You can also press and hold this button for 2 seconds to reject an incoming call. If you don't want to use the Bluetooth connection, you can also connect your Energy Headphones 2 Bluetooth to your music player using the audio cable provided. You don't need to switch on your headphones if you want to use this mode. Simply connect one cable end to the AUDIO INPUT (6) and the other end to your music player to enable this mode.